Josh Ward’s Analysis: Means fills a need for Tennessee, which has looked for more playmaking help at receiver. Means arrives from a high school that annually produces top talent. He will attempt to compete early among a deep group of receivers. 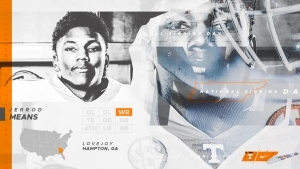 Starred at Lovejoy High School in Lovejoy, Ga.
Two-time Georgia All-Region 4-AAAAAA first-team selection (2017, 2018). 2018 Preseason All-Clayton/Henry team selection. 2017 All-Clayton County team selection. Helped Lovejoy High advance to the 2018 Georgia AAAAAA State Playoffs. Missed some time with an injury during his senior season but still caught 19 passes for 460 yards and six touchdowns. Had over 400 receiving yards and five touchdown catches as a jnuior in 2017. Played wide receiver at Hampton High School in Hampton, Ga., during his freshman and sophomore seasons.